In short it’s a great way to efficiently write clear and maintainable code. The book is short, only 60 pages, but manages to clearly explain how to use the language with well explained examples. 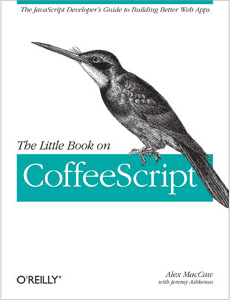 Before reading this book I had not written any CoffeeScript code, but I was curious about it. It has kept coming up in lots of articles and tutorials lately plus the fact that the creator of CoffeeScript, Jeremy Ashkenas, is also the creator of Backbone.js and Underscore.js which are two libraries that I use extensively in my projects. Reading this book has given me a nice introduction which have enabled me to quickly get started using it in a project. The author, Alex MacCaw, has a clear writing style and explains the concepts through easy to follow examples that are thoroughly explained which makes the learning experience both enjoyable and efficient. If you’re interested in getting started in CoffeeScript this book is a great and quick way to get you up and running fast. Since it’s only 60 pages long there’s really no reason not to. I have a hard time imagining a faster way to get going. The Little Book on CoffeeScript is Open Source and you can read it online at GitHub. If you prefer to read a the physical book or have it in e-book format you can buy a copy from Amazon.com or from O’Reilly.